Who Really Caused Our Recession? Home Economy Who Really Caused Our Recession? 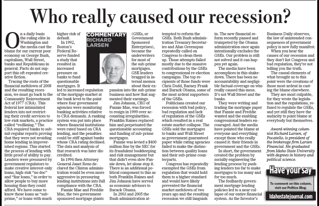 When you hear causes of our recession and they don’t list congress and bad regulation, they’re not telling you the truth. The causal elements of what brought us to this point were the creations of those most ardent in casting the blame elsewhere. They are most culpable, for they wrote the legislation and the regulations, refused to regulate the GSEs, and yet still they have the audacity to point blame at everybody but themselves.